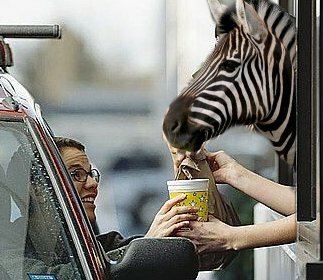 At the drive-thru for the new donut shop in town I asked for my favorite, a vanilla zebra. “The donut,” asked the guy inside the speaker box? A real zebra would be cool, I thought, but there’s no way I could ever fit one in my car. Ha! Funny, Nice, lighthearted post and how did you ever find an image like that?? So where ya been anyhow? I miss you on my Reader and in my comments. But I stalk you on FB so you’re still not free. It’s amazing what you can find with Google. (Or make with Google and Photoshop). I don’t do a lot of blogging between March and October. (Something to do with the increased amount of daylight.) I have noticed whenever I’m on Facebook I get this strange sensation that I am being watched, but no matter how fast I look around there is no one there to be seen. I’ll catch you yet! Have missed your convoluted thoughts lately. Hope all is well with you my friend. Your writing is so consistently good–I also miss seeing you in my reader! Hope all is well. People state the ridiculously obvious too often. You really should have asked for the real one!